Well, it is that time again. Time to review my dividend investing strategy. While I don’t worry about the short term fluctuations of the portfolio and could very well just do a full review at the conclusion of each year, part of the reason why I like doing this review monthly is that it is fun. I know that this strategy is working, but it still has been amazing to see the progress even in just the short term that I’ve been doing it! I also am driven by numbers and love adding things to spreadsheets and creating charts. It will be fun to look back in 10 years and visually see the strategy play out! While the majority of my stocks do not pay in May, the ones that do pay quite well. It was fun to see the May quarter actually turn out to be one of the better months. I’m also excited to receive my first annual dividend from my ADR ownership of Nestle (NSRGY). NSRGY pays a single dividend each year. I received $68.29 and paid foreign taxes of $10.24 plus an ADR management fee of $0.75. I should receive the $10.24 back when I file for taxes. I also just noticed that, unfortunately, Schwab does not allow dividend reinvestment with this equity. Until I start receiving thousands in dividends per month, I’ve elected to leave dividend reinvestment turned on (Schwab offers this for free), hence the reason you’ll see partial shares for most of my stocks. 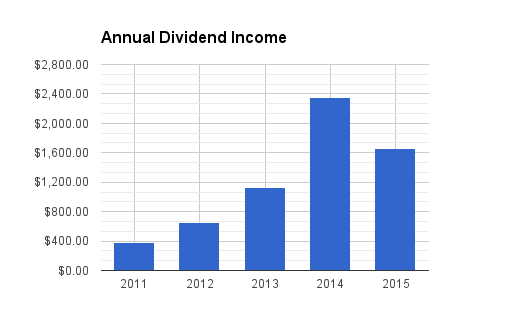 In total, I received $434.95 in dividends for May 2015. Last May I received $163.41 giving me an increase of 166%! It will be absolutely amazing to be able to continue these kind of increases each year, but I highly doubt I’ll be able to sustain that. I haven’t written about it yet, but I’m moving to Chicago soon for work. For the next year, I’ll be paying triple my current monthly rent without a significant concomitant increase in pay. I’m going to try to continue to invest as much as I can, but the cost-of-living increases will make the current investing pace unsustainable, at least in the short term. Of note, I’ve received $1592.77 so far in 2015. This is over $150 more than I received in all of 2013. According to the dividend calendar on my portfolio, by the end of August I’ll have received more dividends in 2015 than in all of 2014. Pretty cool! Options: I don’t have any currently open put options. Looking good Scott. You’re officially entering what I like to call ‘RV dividend money’. You could almost buy an RV and just travel and camp around the US living on dividends at this point, hehe. Congrats on the new job, but my sympathy on the expensive relocation. Welcome to the club on that end, my friend. I feel lucky to spend only $1,050 a month to rent a small one bedroom with a freeway directly behind it. Coincidentally, I’m also doing a job change, finally leaving my cushy network gig for a bigger and better opportunity on a show. The pay is only $150 more a week, but it’s a better title and lasts through February, so hopefully I’ll be able to line something up directly after. I’m thinking this is a guaranteed avenue to that coveted six figure net worth. Also found it weirdly interesting Schwab doesn’t allow reinvestment of NSRGY, and that could be useful info for readers wanting to buy, thanks for sharing your monthly results! Thanks, Ryan! I don’t think I’m quite at the RV stage yet! Haha. Best of luck with your new job too! You can’t let opportunities like that pass by. Sounds like it will work out for you! I always make sure to double check that I have checked the “reinvest my dividends” box so was surprised when that didn’t happen with NSRGY. Schwab usually makes it very easy. There is literally a link that you can toggle between yes or no for reinvesting the dividends. The exact message that pops up is: “Your request to change the dividend reinvestment instructions for this security was not accepted because this security is ineligible for dividend reinvestment.” Maybe some other people that own NSRGY can chime in too and let us know if this is also the case at other brokerages. Thanks again for visiting! Keep up the good blog posts. I’ve been eyeing the railroads as well…just need to save some extra cash right now to pay for that rent! Hi Scott. Thank you for sharing your Journey with us. It’s awesome receiving these dividend checks. What a wonderful feeling. You’re doing fantastic bud. Once you finish your training, You have to celebrate! Will be another new chapter in your life. It’s gonna be a bright one. Keep up the great work and glad I’ve found your blog. Take care my friend. Thanks, Hustler! The dividends are awesome. Part me of thinks that it would be kind of fun to actually physically get the checks in the mail and walk to the local bank to deposit them… Direct deposit is just so much easier! I’m definitely looking forward to the next year. I can certainly see the light at the end of tunnel. Take care! Does Schwab allow you to reinvest in other companies with a given dividend or just back into the same company? I like the ability to buy partial shares. What is the cost of a trade? Nice job on the increasing dividend income. Good luck on the new position. You seem to be in the home stretch, so keep up the good work. Thanks, DividendDreamer. Schwab allows dividend reinvestment in all my other stocks. It is as simple as toggling a button to “yes, I want to reinvest the dividends.” The dividends then buy partial shares in the company they came from. You can’t pool dividends to buy something else like you can with Scottrade. I guess this is not allowed with ADRs that are in the pink sheets. Dividends were reinvested automatically for my other ADR, BBL. The cost of trades are $8.95. I also recently got the options trades costs lowered slightly, but I’m blanking on the exact numbers.